SAN DIEGO — The U.S. Disabled Sailing Championships Oct. 26-28 included a hometown winner: Point Loma resident James Levinson took first place in the Capri 22 triple-handed fleet, with fellow sailors Andrew Fisher of Greenwich, Conn., and Mike Hersey of Hyannis, Mass. The annual event was hosted by Southwestern Yacht Club, with races taking place in North San Diego Bay throughout the weekend. In its first year on San Diego Bay, the event was open to any sailor with a physical disability, and past event participants have included quadriplegics, paraplegics and amputees, as well as individuals with multiple sclerosis, cerebral palsy, polio and ALS. Levinson, who recently completed a 22-day sailing expedition through the Channel Islands in preparation for the regatta, has been diagnosed with FSH Muscular Dystrophy — an incurable, untreatable disease that eats away at his muscles. Levinson, Fisher and Greenwich dominated the triple-handed championship fleet, taking first place in five of eight races, and all three races of the final day. The team won by five points over Rick Doerr, Clifton, N.J.; Gerard Tiernan, Falmouth, Maine; and Michael Ross, Oceanside. In the 2.4 mR singlehanded fleet, Charles Rosenfield of Woodstock, Conn. held off Joseph Hill of Seabrook, Texas to win his third Judd Goldman Trophy. Rosenfield came up big in Race 7 — the final race of the championship — by posting a bullet to seal the win. Hill finished third in Race 7. Rosenfield was third in Race 6 and Hill was second. The win gives Rosenfield three US Disabled Singlehanded Championships, as he previously won in 2011 and 2009. In the Martin 16 double-handed fleet, Michael Strahle of Redding and Donna DeMarest of Waterbury, Conn. took home the Chandler Hovey Trophy by a point over the hard-charging team of Bob E. Jones and Ken Kelly. There were also three developmental fleets that raced over the weekend, including the Martin 16 (doublehanded), Access Liberty (singlehanded) and Access 303 (doublehanded). The developmental fleets ran in tandem with the championship fleets, and were included to provide returning or new sailors an opportunity to race and work on tactical skills and boat handling. Many of this year’s participants have Paralympic ambitions. Several past participants of this championship have gone on to compete in the Paralympic Games, including the 2008 Paralympic Gold medalist, the late Nick Scandone. 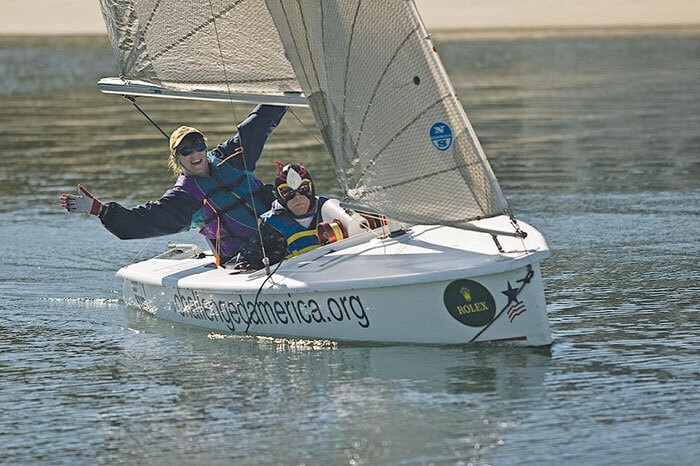 The U.S. Disabled Sailing Championship has been hosted by different sailing organizations around the country, to expand awareness of disabled sailing and encourage disabled individuals to take up the sport.